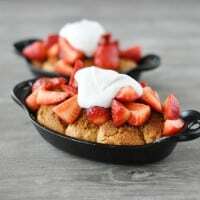 These Paleo strawberry shortcake skillets feature sweet, grain-free drop biscuits topped with macerated strawberries and whipped coconut cream for the perfect treat! Oh boy, oh boy, do I have a special treat for you! A little while back, my friend Juli and I made plans for me to write a guest post on her blog, PaleOMG. 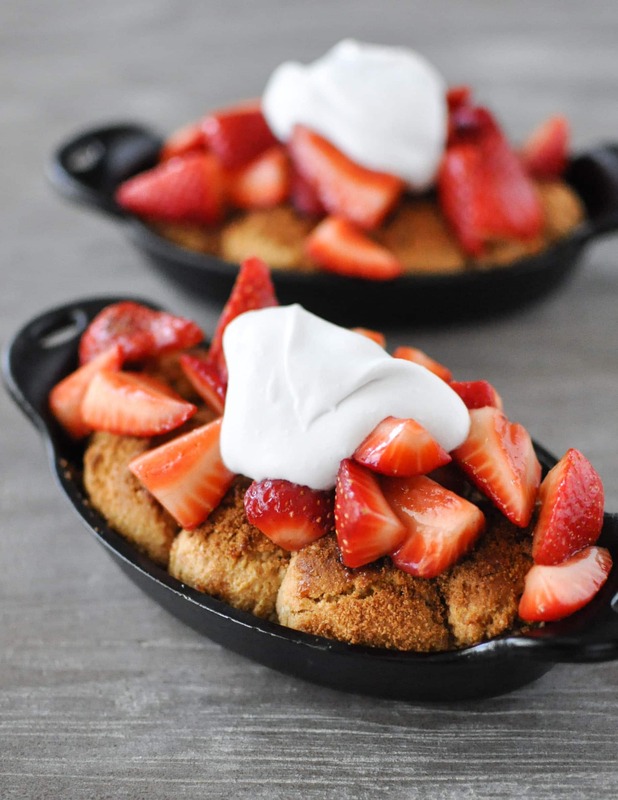 I threw out a couple different ideas but we both thought that a strawberry shortcake skillet sounded perfect. I got to work perfecting my biscuits, Paleo-friendly whipped cream, and macerated strawberries. 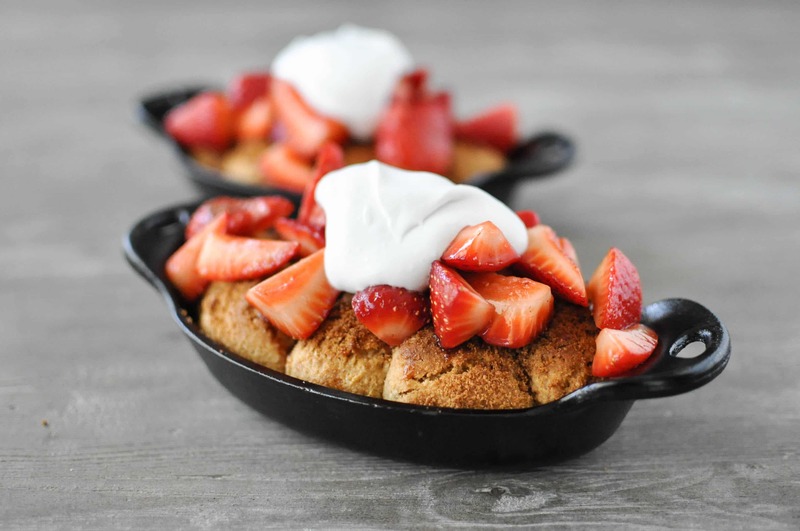 During my baking experiments, a brilliant idea struck me – what if we throw those strawberries and whipped cream over some drop skillet biscuits! I pretty much faint from pure joy every time I have a savory skillet biscuit – the sweet version must be just as wonderful. Actually, I think they're better. Mostly because they don't involve that painful “I just ate a whole lot of wheat” belly. 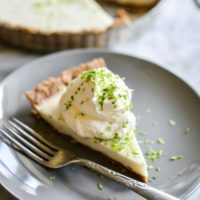 You guys are going to absolutely love this dessert. 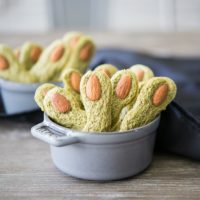 I made them in these small oval cast iron skillets but you can easily double the recipe and bake all the biscuits together in one large skillet – making for one totally jaw-dropping dinner party finale! Whisk the dry ingredients together until they’re well incorporated and all clumps are broken up. 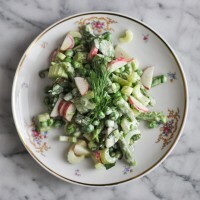 Whisk the wet ingredients together and then add them to the dry. Stir until the mixture is even. Grease two 6” oval skillets with the coconut oil. Using a #40 scoop (or just a big spoon that equals about 2 tablespoons), drop balls of the dough into the greased skillets. You should get about 7 drop biscuits for each dish. Sprinkle the top of the biscuits evenly with the coconut sugar. Bake at 350 F for 20-22 minutes, or until a toothpick comes out clean. 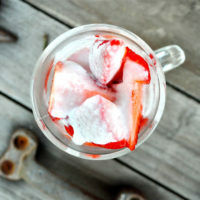 Let cool then top with the strawberries and coconut whipped cream. Set covered in the refrigerator for at least 30 minutes before serving. Add the hardened coconut cream from the can of full-fat coconut milk to a chilled mixing bowl with the honey and vanilla extract. Beat on high for 5-7 minutes, or until stiff peaks form. Store in the refrigerator until just before serving. Those skillets are so cute…where did you get them?